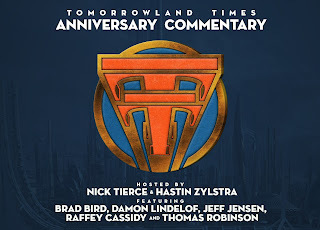 Join Hastin and Nick as they present a feature-length audio commentary companion to Tomorrowland, including exclusive interview excerpts with Brad Bird, Damon Lindelof, Jeff Jensen, Thomas Robinson, and Raffey Cassidy! *To sync this track with the film, press "play" when the first opening logo firework bursts. - 00:00:59 - Damon Lindelof on the editing process. - 00:07:13 - Brad Bird on pin variations. - 00:13:52 - Damon Lindelof on the first draft. - 00:19:27 - Jeff Jensen on the first draft. - 00:27:20 - Jeff Jensen on Casey's character. - 00:38:50 - Damon Lindelof on length. - 00:40:45 - Damon Lindelof on Walt Disney. - 00:51:20 - Damon Lindelof on Drummelberg. - 00:55:48 - Damon Lindelof on Frank's holographic dog. - 01:01:34 - Thomas Robinson & Raffey Cassidy on flashbacks. - 01:10:18 - Jeff Jensen on "Before Tomorrowland". - 01:28:19 - Damon Lindelof on Nix & Plus Ultra. - 01:41:49 - Damon Lindelof on Nix's speech. - 01:58:05 - Brad Bird on the creative process. - 02:01:15 - Brad Bird on the end credits design. - 02:02:03 - Brad Bird on the future of Tomorrowland. - 02:02:45 - Damon Lindelof on the future of Tomorrowland. - 02:04:13 - Jeff Jensen on the future of Tomorrowland. - 02:08:39 - Final words from Damon Lindelof. This commentary was recorded in 2016 for the first anniversary of the film "Tomorrowland" and released for its second anniversary on May 22, 2017. My name is Michael and I have Autism. Even though, not everyone loves Tomorrowland, Me, Barrett, Ben, and Arielle, loves Tomorrowland so much. Plus, my birthday is coming up in November 9th. I would like to join at D23 Expo 2019, meet Brad Bird and show him https://www.screenplaysandartbymichael.com/ in order to go to Disneyland, ride on "It's a Small World" ride to the future, and film the Tomorrowland sequel. I wish I could meet him. Remember Dreamers Stick Together.